Here is the next episode in the Table Top biweekly series hosted by Star Trek's Wil Wheaton on Felicia Day's Channel Geek and Sundry. 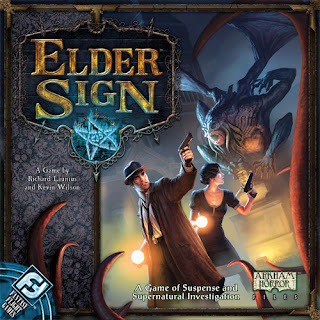 Take a seat and let's watch below as Wil and guests play a game of Elder Sign. This week Wil's guests; Felicia Day (actress, producer, writer), Bill Prady (co-creator, exec. producer, writer - Big Bang Theory), and Mike Morhaime (pres., co-founder - Blizzard Entertainment) work as a team in this cooperative card game of dice and insanity to defeat the Great Old One. See who ends up carrying the team. Come in and see our fabulous selection of strategy games, Euro-style games, war games, family games, card games, dice games. We carry Chess set, Backgammon, Cribbage, and Go sets as well. Also for the puzzle enthusiasts we carry quality puzzles from Ravensburger, TDC, and White Mountain.